BrainFizz - Routing, Making, Custom projects & Training. 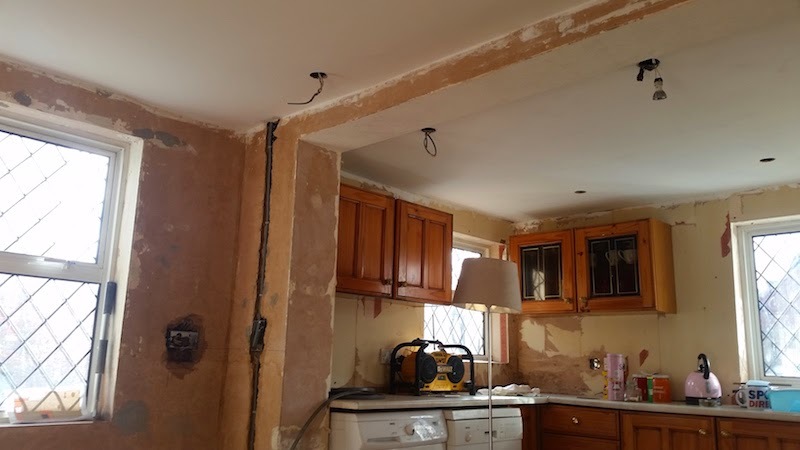 : New Kitchen: A little more complex than stripping wall paper and painting! 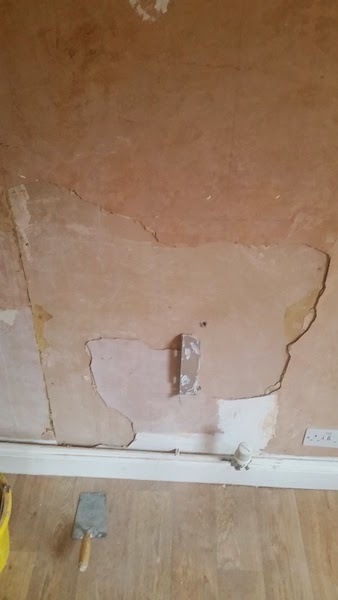 I stripped all the wallpaper and took of the radiator, only to find the first headache. 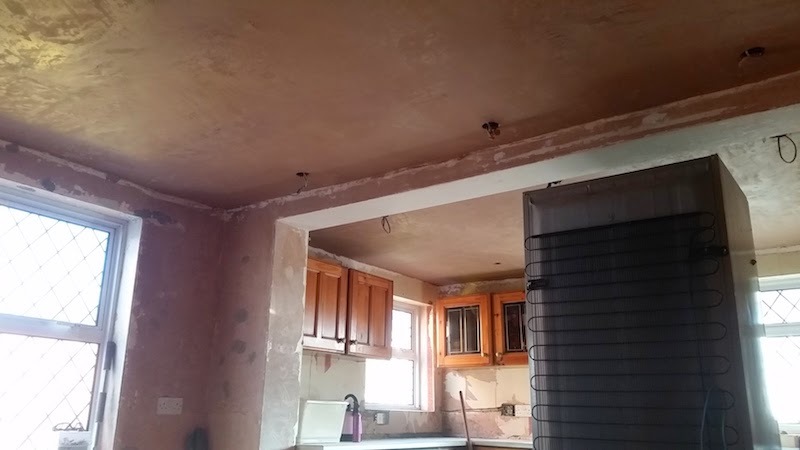 The plaster had blow all around one side and needed to be redone, not a problem, but it turned into a little more than i had first thought. The mounting plate for the radiator had been really poorly fitted (by a plumber only a few months previously. 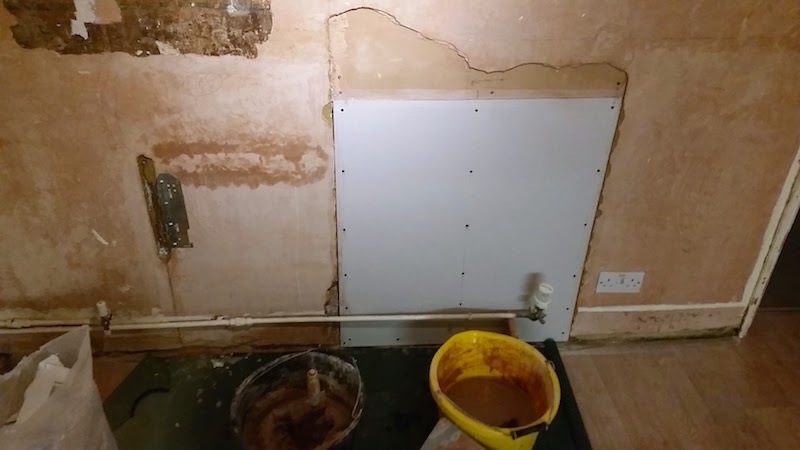 The wall here was actually plasterboard (drywall), and they had just used regular plugs which were completely unsuitable meaning that the radiator was not fixed securely to the wall on one side. 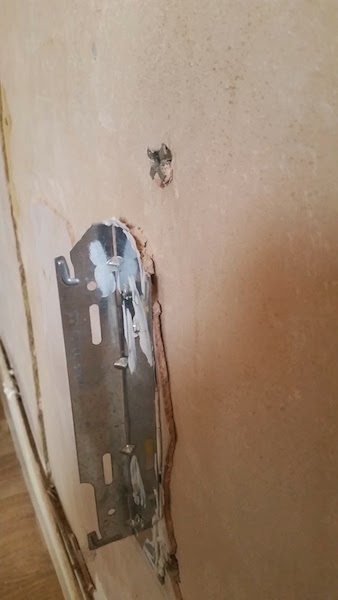 Not only that, because of the mess they'd made of fixing it, I decided to reinforce the stud work to get a good mounting......off with the wall! 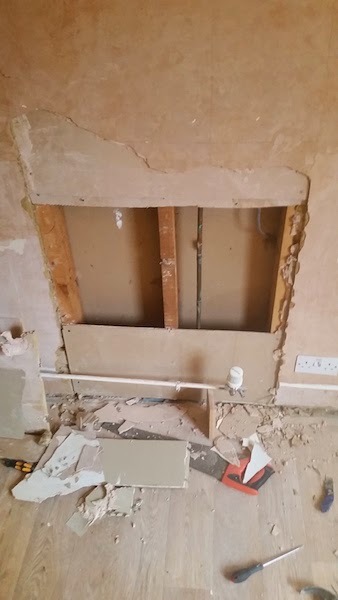 Originally I wanted to fix a piece of plywood between the studs to then screw into to fix the bracket, as you can see in the picture though, a random 15mm copper pipe running vertically through the studs meant a slight rethink. A little careful measuring revealed that - had the radiator been fixed about 10mm to the left, it would have been fixed straight into the stud! There was no way i was going to move the radiator, as this would mean adjusting the pipes to it, and so decided to glue and screw a second stud to the existing one, and effectively widen it. No need to run the full height, so a 4' length that was around was duly fitted inside the wall. This was all closed back up and made ready to skim. 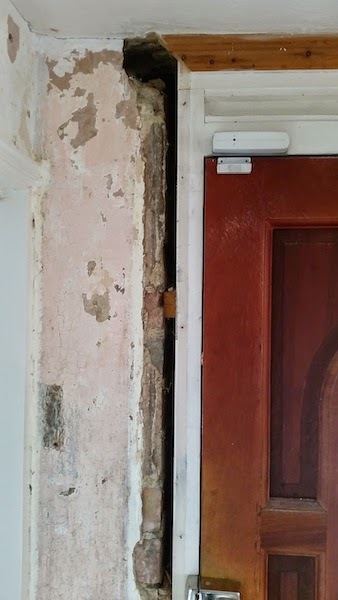 Next I moved on to the back door, which will eventually be refinished, but I wanted to sort out the 3" architraves that had (for some reason been) been added - rather poorly in have to say. It didn't take long to realise what the history here was. 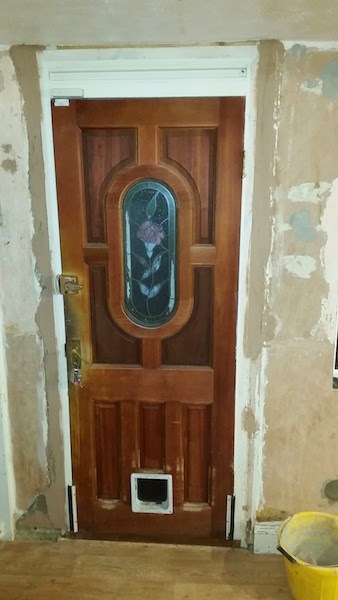 At some point this door had been changed and whoever had done it had left a 2" gap around the edge. 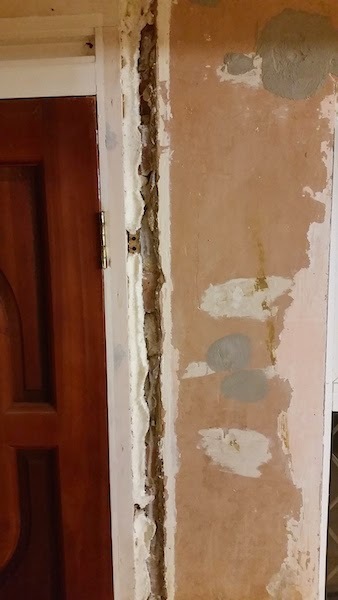 You can see here I've filled the void with expanding foam, but once the trim was removed, the gap was open - al the way back to the external render. This was filled and plastered over. 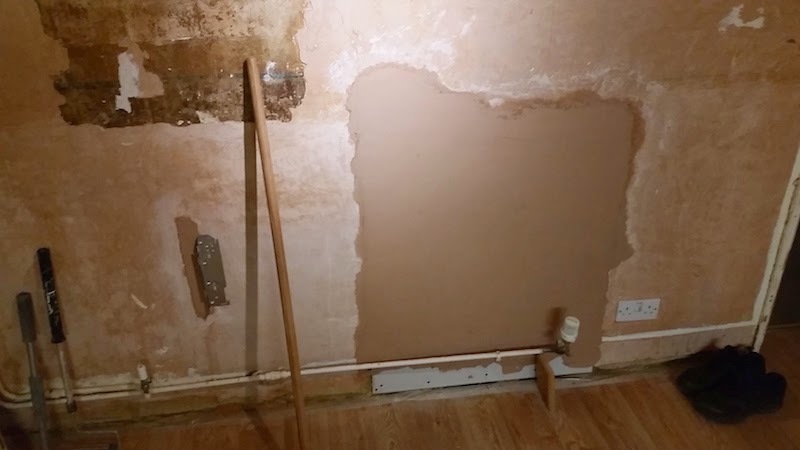 A little backing plaster, and the wall was ready for skimming. As was the radiator wall - I made sure to measure the distances between the two fixing brackets. You can just make out a mark on the floor, directly under the screw. I also wrote it in pencil on the wall so I would be able to find the measurements easily when the time came. I also marked where the pipe ran too - just in case for the future. Julien the Electrician was great, he worked quickly and managed to fit things around both my speed and his own workloads, so it couldn't have been much easier. here we changed a 4' tube for 6 LED spots. 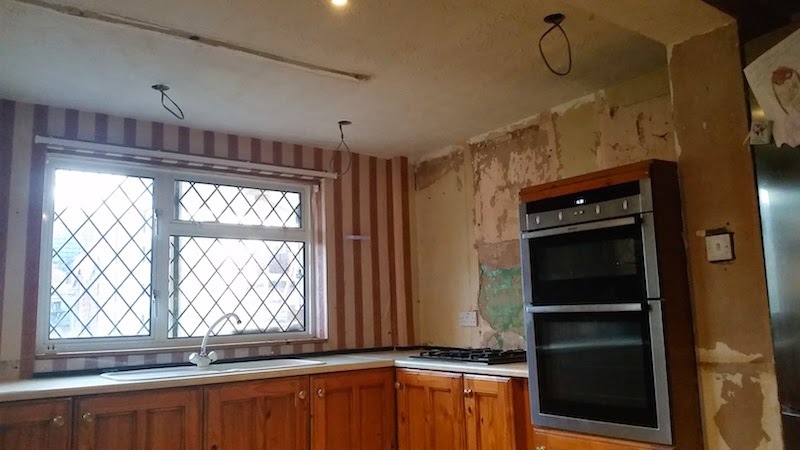 Both sides of the kitchen, ceilings skimmed, and ready for a mist coat. Here you can see where the cable comes down to feed the new induction hob. Even though it meant having the floorboards up in two bedrooms and a corridor upstairs, i was still glad not to have to have the concert floor up downstairs! The socket to the left was also modified to take a deeper back box to accept a double socket with USB charging points. 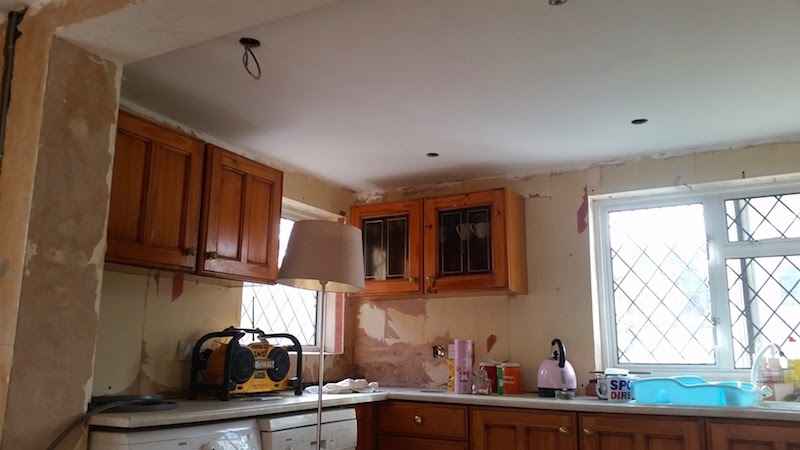 People always say the room starts to feel like a room once there's plaster on the walls, and yes it does, the wet trade marks the point between 1st and 2nd fix, but it does seem somewhat dreary and dark, at least until a mist coat is applied to brighten things up. 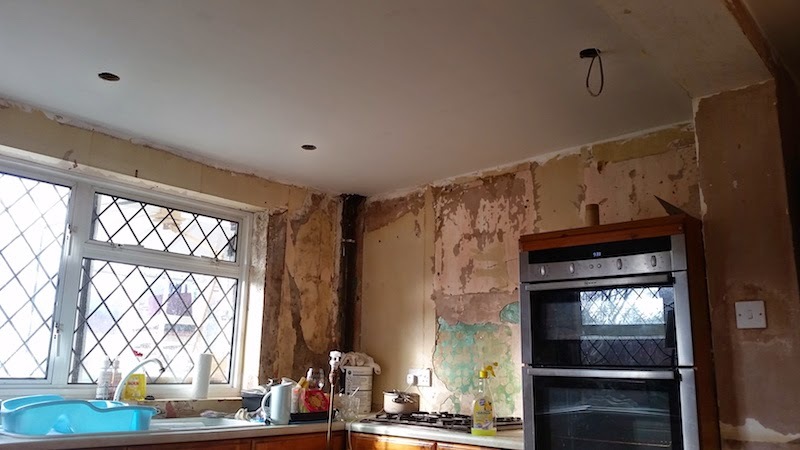 Here the ceilings have had two coats of emulsion. I used Dulux Super Matt paint, as you can apply it to plaster that's not fully dried, without any ill effects - time was a factor here. Normally you'd do all the painting at the end, and even though these walls were to be skimmed, I painted anyway. a little attention to detail around the transition with the walls and you can skim the walls with no real damage to the paintwork. besides with no lights at this point, I wanted it as bright as possible. 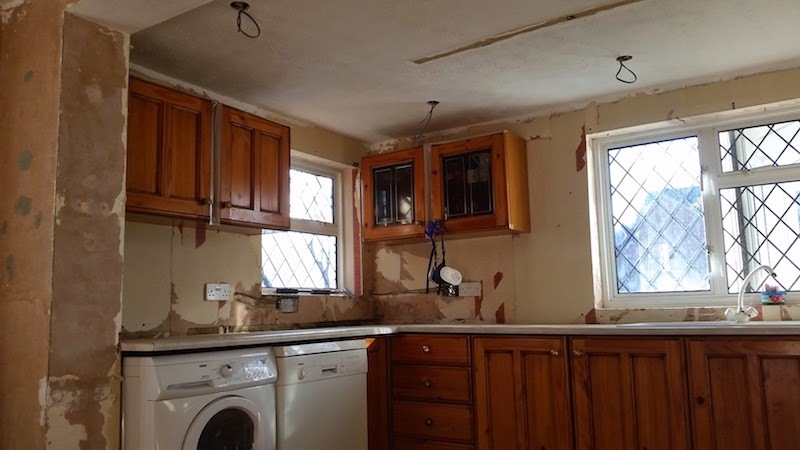 With the first half of the room decorated, albeit in need of glossing, and the delivery looming, it was time to start thinking about the kitchen side, and all the services that would be effected.... but thats for the next instalment!